A friend of mine shared an article about the importance of planting native trees and plants to help provide for feeding baby birds. Insects that are used to feed baby birds evolved along with the native plants and the birds. If the entire landscape is planted with foreign derived plants, the insects, especially their larvae that feed on the native plants, will not be available to feed the growing birds. This led me to consider writing this article. You might not think it is important to provide for wildlife especially if you live near a preserve or conservation area. However, Pinellas County is very densely populated (3,347 people per square mile) leaving very little open natural space for wildlife. By wildlife, I do not mean just larger animals like deer, bobcats, and coyotes. We need to consider birds, butterflies and other small creatures as well. Bees and other pollinators have gotten a lot of press lately too. One reason postulated about the decline in bees is the decline in natural sources of nectar plants. The way that we manage our yards and neighborhoods can affect the wildlife present. If each resident provided some native habitat for wildlife it would greatly increase the biodiversity of the whole neighborhood and could have a good impact on the surrounding habitat in the preserve or conservation areas. Unfortunately, the conservation areas are separated from each other by houses and landscapes. If each of us planted some areas with native plants and reduced pesticide use we could provide a corridor to connect the conservation areas and also the preserve so that animals would be able to travel from one natural area to another. habitat. Essentially, wildlife habitat consists of food, shelter, water, and space. 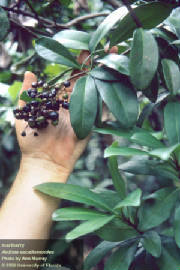 It is best to provide plants that produce fruit and seeds to feed the wildlife. If we provide unnatural food sources, wildlife can become unhealthy and possibly die prematurely. This is especially true of wild animals. Provide food. 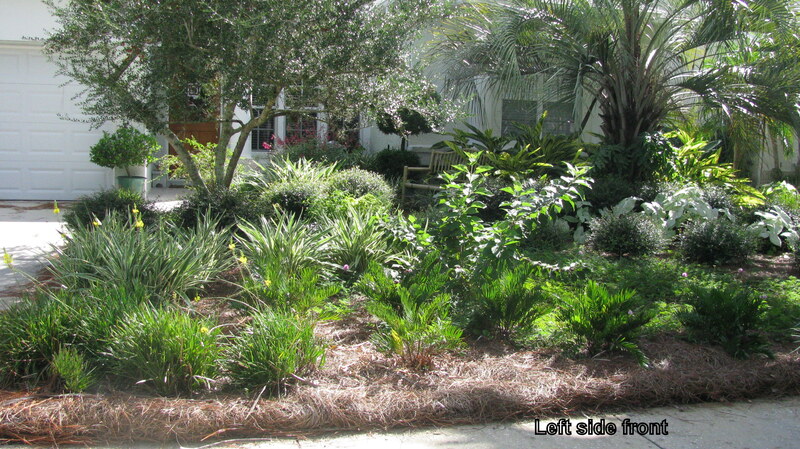 Select plants (preferably Florida native) with seeds, fruit, foliage, or flowers that butterflies, insects, birds, and other wildlife like to eat. There are a number of plants that provide nectar rich flowers, berries, fruits and seeds. Reduce insecticide use. Every time insecticides are used on your lawn or landscape plants, you reduce insect populations, which provide an important food source for birds and other small critters. Reduce the amount of mowed lawn area. Planting low-traffic areas with a variety of groundcovers instead of grass can provide more potential food sources and habitat for wildlife. My pet Black Racer snake lives in my groundcover front yard. Consider only having lawn grass in areas that are needed for children and pets to play. Increase vertical layering. Use plants with varying heights and sizes together to provide cover and more feeding opportunities for diverse species of wildlife. This also provides more opportunities for birds to build nests. Supply water. All water features will attract wildlife if the water is not treated. A natural water source like a pond or creek is nice, but a fountain or birdbath will also attract wildlife. Be sure to clean a birdbath every few days by scrubbing the surfaces with a brush. It is best not to use soap or bleach. Also, be sure to change the water every couple of days to discourage mosquito growth. Manage pets. Some pets will kill wildlife if left outside unsupervised. Dogs and cats are natural hunters. If you allow your pets to kill wildlife, you will negate any efforts you make toward attracting wildlife. This is especially true for cats allowed outdoors. In Pinellas County, it is against the law to leave cats outside. Scientists estimate that domestic cats kill hundreds of millions of birds and possibly more than a billion small mammals each year.